Adherence to California environmental and labor laws, among the most stringent on the planet. 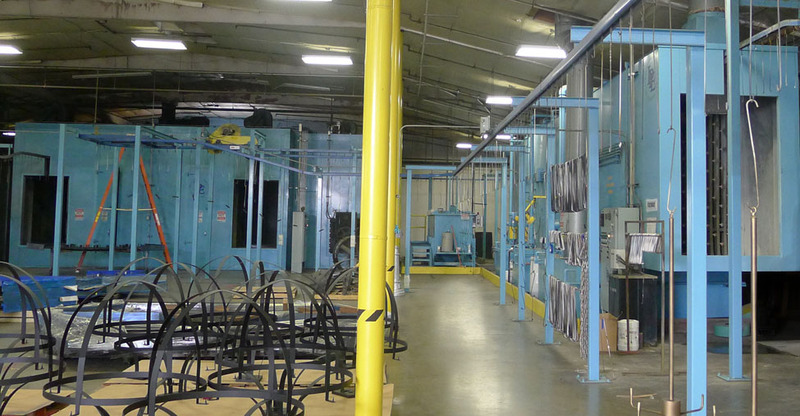 A three-stage powder coating system that is designed to minimize our environmental impact. The water released from our system meets standards that allow it to pass directly into the LA County waste water system. Further, the system uses zero VOC categorical components and is sodium free. Formulation of finishes that maximize employee safety and minimize environmental impact. Finishing materials that are EPA and SCAQMD compliant. Facility lighting that is time and motion censored and utilizes 277v fluorescent. Facility heating and cooling systems that are radio-controlled to eliminate off-hour and peak-hour spikes in power usage. A metal fabrication department that utilizes state-of-the-art computer layouts for maximum material yield and minimal material waste. Lab-certified pH monitoring of our water discharge system. A packing department that recycles 35% of over-run materials to minimize paper waste. All paper and wood products are purchased from vendors who are compliant with the Sustainable Forestry Initiative. 100% of our excess metal is recycled through the US Steel Reclamation Program of America. 100% of our excess plastics are recycled through a local Southern California reclamation company. A CEU accredited seminar designed to aid in custom specification. This course guides the design community through the specification process, helping to create smarter, energy efficient, lighting packages.